StopTech Sport Slotted Rotors (formerly Power Slot) are high quality slotted, one-piece, direct replacement brake rotors used with your factory brake system. 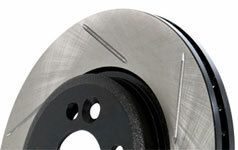 StopTech Sport Slotted Rotors prevent glazing of the pads, add bite and improve wet and dry braking performance. Each StopTech sport Slotted Rotor is produced using a high quality StopTech Premium Rotor, featuring electro-coating, Double Disc Ground, Machined Finishes, Split Castings and Mill Balancing. StopTech Sport Slotted Rotors have a unique slotted pattern for the left and right sides of the vehicle. For these directional friction surfaces, straight or pillar internal cooling vane rotors are used for maximum performance. 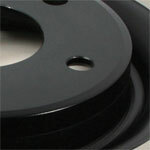 StopTech Sport Slotted Rotors utilize an Electro-Coating finish that provides long lasting corrosion protection. Electro-Coating is an electrostatically applied finish that is designed to withstand 400 hours of salt-water exposure without rusting. StopTech Sport Slotted Rotors feature a double disc ground, taper free finish. Double disc grinding ensures parallelism, eliminates run out and provides near perfect disc thickness variation (DTV). Double disc grinding leaves a non-directional finish on the friction surface area for more effective pad-rotor break in. This finish also provides quieter and smoother stops. StopTech Sport Slotted Rotors feature 100% fully machined finishes, including rotor hats. In addition, StopTech Sport Slotted Rotors are also inspected for balancing and mill-corrected to a tolerance of less than 2 oz. per inch. This extra process provides better rotor balancing and creates a cleaner, more professional looking component. Center-split core castings provide uniform heat transfer and thermal efficiency from the friction plates into the cooling vanes, resulting in superior braking power and safety. Competitors' vanes are often asymmetrical, which can lead to uneven heat transfer and compromises in performance and cooling. StopTech Sport Slotted Rotors feature O.E. style internal vane designs. This attention to detail ensures each StopTech Sport Slotted Rotor will function just like the original part. **Note: Please confirm the rotor diameter on your vehicle prior to ordering. If you need help locating your rotor diameter please Contact Us today. StopTech Sport Slotted Rotors are priced and sold individually on our website. * While the required rotor diameter can be determined based on your VIN number, many cars now have different sized rotors fitted by mechanics than what the car was originally fitted with. As such, we advise that you physically measure the brake rotor diameter to determine your correct rotor size prior to ordering.